50% of consumers make their buying decisions based on packaging. With over 50 years of experience in the packaging industry, we understand the benefits that produce packaging offers growers. Quality produce packaging not only protects the grower’s investment, it creates attractive, consistent products that generate high levels of shelf impact. These products look better, last longer, taste better and outlive un-packaged products on retailer shelves by a large margin. Crawford Packaging is the only turn-key, full-service packaging equipment and consumables wholesaler. Our Packaging Specialists will perform a complete pack/cost analysis to fully understand your packaging needs and processes. They will look to find areas of improvement in your existing packaging solution and increase efficiency and savings. This can include the improving existing packaging materials costs or the addition of automation. At Crawford Packaging, we are experts in produce packaging. We work with world class packaging equipment and consumables partners to deliver the best produce packaging options to your company. Each of our Packaging Specialists have worked extensively to understand the needs and demands of growers today. Working with you, we will develop cost effective packaging solutions that protect your produce and improve products shelf life. Check out our produce brochure in English and Español. Shelf Life & Environmental Benefits. We provide growers with environmentally friendly packaging solutions to help reduce consumption and packaging waste. We work with new low gauge films that provide the same levels of protection as higher gauge films. Our packaging solutions can offer growers the ability to reduce packaging material by as much as 25%, improving consumption and reducing packaging waste. We provide growers with packaging that not only looks good, but improves product shelf life. Produce packaging extends shelf life through a variety of protective methods. Proper produce packaging protects produce from physical damage, light, air and temperature changes that can cause spoilage. Protective films and containers allow for the proper exchanging of gasses, keeping products alive and fresh for longer times. Modified Atmosphere Packaging works to reduce produce respiration rates, reducing the aging process. With a wide range of produce packaging options Crawford Packaging has the right package to help improve your shelf life and decrease food waste. Produce packaging automation has become a key aspect for efficient and timely produce packaging. New automation technology has opened high speed packaging possibilities, allowing grower/packers to greatly reduce the time to market. Our Packaging Specialists will analyze your existing packaging solution and provide suggestions on how packaging automation can help improve your existing produce packaging and reduce time to market. Produce trays and lids are opening new doors for seal and go produce packaging. With a variety of seal and film types, Tray Sealing offers fast sealing options for a variety of produce tray types. Horizontal Form Fill Seal packaging machines, or Flow Wrappers, now offer high speed packaging solutions for sensitive produce products. These machines increase packaging speeds and improve overall packaging efficiency. Recent advances in shrink film technology and equipment are extending shelf life, reducing waste and providing high quality, attractive produce packaging. Crawford Packaging has been working with companies to develop impactful packaging solutions since 1980. We understand the highly competitive produce market and can help you stand out on the crowded retail shelves. Utilizing our state of the art material handling procedures, backboned by first-class quality control standards and documentation, we have been able to achieve and maintain an industry leading fill rate with our customers. These fill rates paired with our extensive knowledge and packaging experience has earned us our standing as leaders in produce packaging. Crawford Packaging actively works with our partners to bring the most innovative packaging equipment and packaging materials to our clients. This has led to the development of the Crawford Pillars programs that create savings up to 30%. Our commitment to quality has led to Crawford Packaging being an accredited ISO 9001 business and the addition of full-time Quality Management team to monitor quality and manage our in-house lot traceability system. How we helped a Produce Packer increase produce sales and profitability through the addition of a turnkey automated packaging equipment line. 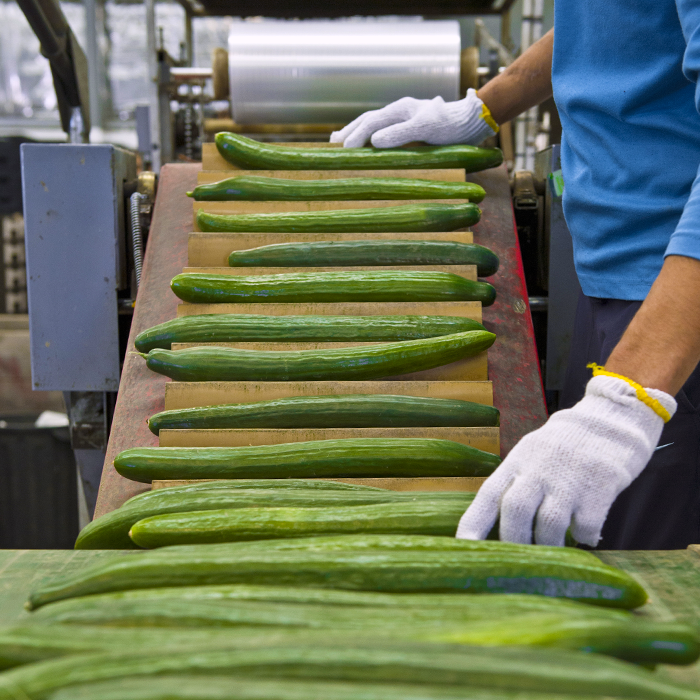 How we helped increase a Grower’s pepper packaging throughput and efficiency by replacing low-quality equipment with a high-speed VR-8 Master Flow Wrapper. How we helped a fresh produce grower and packer use Top Seal packaging to reduce packaging material and offer environmentally friendly packaging to customers. How we helped a Client transition from a fresh produce grower to a grower/retail seller with cost effective bagged produce packaging. How we helped a client improve greenhouse cleanliness while reducing labour and the risk of spreading pests and disease with an industrial floor scrubber. How we helped a fresh Produce Grower improve their tray sealing productivity by 30% through improved tooling design and increased packaging volumes.